Garlic is among the oldest culinary and therapeutic herbs and spices (as it literally is both an herb and a spice), having been employed as such since the time of the Ancient Egyptians. Garlic is well-known for its pungent aroma and its liberal incorporation in a number of Hispanic, Mexican, Italian, and Eastern European dishes, although it also plays a major role in a number of Asiatic dishes. Commonly believed to be a native of the New World, garlic is actually a relatively 'modern' strain of an initially wild variety of garlic (Allium longicuspis) which thrived for the most part in Central and Southeast Asia, with a few thriving populations littered throughout the Asian continent. Garlic is a close relative of the onion, chive, and leek, although its purpose is more akin to that of the onion in that the chief plant-part employed for culinary and medicinal purposes is its fleshy bulb, that, like the onion, grows underground. The garlic plant is characterized by its long, onion-like stalk which is verdant green to jade-green in colour, with the occasional presence of yellowish inclusions in the leaves. A less well-known but highly noticeable feature of the garlic plant is its flowering head, which is composed of tiny 'fuzz-ball' like hairs (in all actually, seeds) of a whitish-hue (with the occasion presence of pale pink or lavender) that extends from tiny reddish or white stalks. These flowers grow on the tops of the main leaf, initially from a bulb-like protrusion which peels away as it blooms to reveal the tiny profusion of petals. While the bulb is most commonly employed constituent of the plant, its leaves as well as its flower may also be employed both for culinary and medicinal purposes, although it is used only rarely. With its antimicrobial and antifungal properties, fresh garlic may be further employed as a topical anti-allergenic, especially when used to relieve the pain associated with insect bites. In traditional Filipino folk medicine, the juice rendered from crushed garlic has even been employed to treat snakebites and dog bites (usually by applying it to the site of the bite). It was believed (albeit erroneously) that the garlic helped to stave-off the poison or denature the rabies. It is now known to be ineffective, with the only positive results being numbing the area from pain and protecting it from further infection due to its antimicrobial properties, in effect, sterilizing it. Nevertheless, dog-bite healers and false shamans (called tandok) still employ garlic as a remedy for dog and snakebites regardless of its ineffectiveness. Surprisingly, instances of recovery from these known lethal happenstances are common. A paste made from fresh garlic can be used as a remedy for headaches, and, subsequently, feelings of dizziness and nausea by a moderate application of the substance to the forehead. This paste may also be employed as a local disinfectant for open wounds and cuts via applying it directly to the affected area and was rumoured to have been employed by Filipino revolutionaries during the Spanish Conquest to treat wounded comrades and help protect their wounds from gangrene and rot. 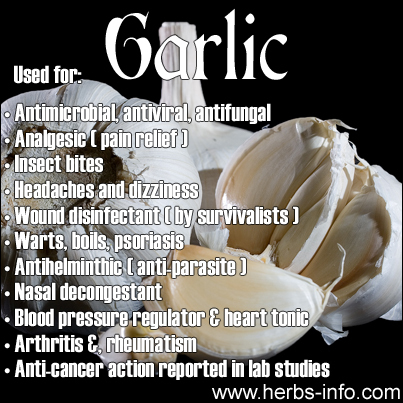 Applied liberally once or twice a day, it is even known to help treat all sorts of fungal infections such as warts, boils, carbuncles, athlete's foot, and even dandruff, although topical application of garlic must be minimal, and a small skin-test prior to general application may be necessary, as garlic can cause allergic reactions and contact dermatitis, with symptoms ranging from a mild itchiness, an overall redness in the area of application, to a uncomfortable burning sensation in patients with hypersensitive skin. 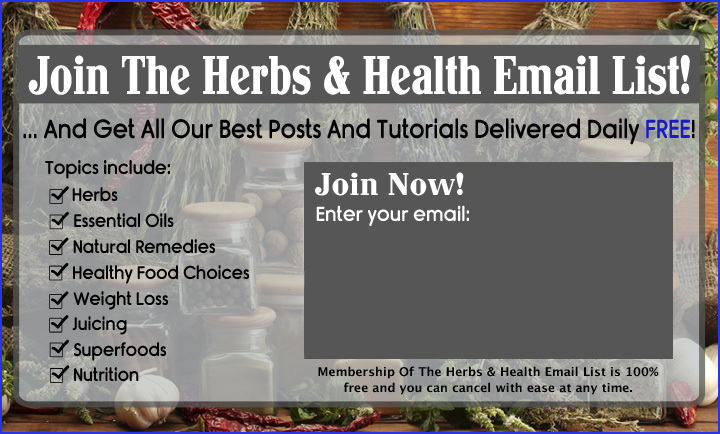 Raw garlic may further be employed medicinally by creating decoctions, of which, depending on the concentration, may be employed as a remedy for everything from fevers, colds, flu, coughs, and hypertension. Very potent decoctions of its bulb, leaves, and flowers have even been employed as a purgative and antithelmintic, while milder decoctions of the cloves have been drunk as a remedy for stomachaches, colic, dyspepsia, and dysmenorrhea. The juice rendered from pounded garlic cloves, when used by itself or combined with a strong reduction (reduced decoction) of its flowers is also given as a remedy for coughs, asthma, sore throats, hoarseness of voice and even gout. In some cases, its un-palatability is remedied by the inclusion of honey. Chopped fresh or dried garlic cloves may even be employed as a remedy for nasal congestion and dizziness through the creation of an inhalant through throwing a handful of chopped cloves into a tub of boiling water with a dash of vinegar. When infused with oil, it is commonly employed to flavor salads and an assortment of other dishes. This oil may be further employed as a salve for the treatment of arthritis and rheumatism, and baldness. To this effect, garlic has even been integrated into anti-hair fall or anti-alopecia shampoos, as it is believed to effectively thicken and darken hair in Traditional Chinese Medicine. Integrating garlic into one's daily meals may even help to improve one's metabolism, and keep certain diseases at bay. It is said to help regulate blood pressure, improve heart-health, and boost the immune system. One drawback to the regular consumption of garlic is the negative 'garlic breath' that is exuded after consuming the spice, although blanching and chopping (instead of crushing) garlic prior to its integration into dishes may help to lessen the malodourous nature of the spice (sadly, at the cost of some of its savour). Garlic has been made into food supplements (typically as 'garlic oil' and encased in softgel capsules), or powdered and encased in vegetable capsules or made into tablets, taken for its general benefits, or for the therapeutic management of arthritis, rheumatism, sclerosis, and high blood pressure. In Eastern-European and Slavonic folklore, garlic was useful for deterring prikoli - vampires, and is in fact stuffed in the mouths of people suspected of vampirism (with or without the trademark stake through the heart). In Filipino mythology, garlic is hung upon doorways to protect the home from the entry of evil spirits. It is also placed in windows to deter the visitation of aswangs (literally, demons in human form) and manananggal (disembodied female flying monsters) who would feast upon the flesh of unborn fetuses! Garlic would be employed by local shamans and healers (tambalan) to enchant an item for demon-slaying purposes by rubbing it along the edge, blade, or body of an object, and then consecrating the whole with holy water, rain water, or salt. Some witchdoctors even employ it to treat animal bites, snake bites, and, in ages past, the infectious bites of supposed demons or shape-shifters. In ceremonial magick, garlic is used for protection, money, and health spells. Keeping a bulb of garlic beneath one's pillow was said to deter nightmares, while incorporating a clove of garlic in a medicine pouch or juju bag helped to attract success and grant the wearer or bearer strength and resilience from physical and spiritual or psychical ills. While the consumption of garlic is relatively safe, excessive intake of garlic may cause mild stomach discomforts. Perhaps the most well-known symptom of garlic consumption is halitosis. When employing garlic topically, one should be careful to note of any type of skin-sensitivity, as prolonged or liberal topical application of garlic (in infused oil or poultice form) may cause contact dermatitis in some individuals. People who are allergic to plants from the Allium family should avoid the consumption of garlic as it can cause severe allergic reactions. Furthermore, individuals who are on blood-thinning medications should avoid the liberal consumption of garlic or garlic-based supplements as it may cause internal hemorrhaging or compromise the efficacy of their medication. In moderate dosages, garlic is safe for both pregnant and lactating women, although the consumption of strong decoctions made from its bulb, leaves, and flowers is not advised. General consumption of the cloves or the integration of any of its constituent parts into meals as a seasoning or condiment though, is entirely safe.